I don't think I had left Angel's driveway before the drops started. By Vernon it was a massive driving rain that the wipers were having a challenge dealing with. The day before it was cloud free and about 35C. 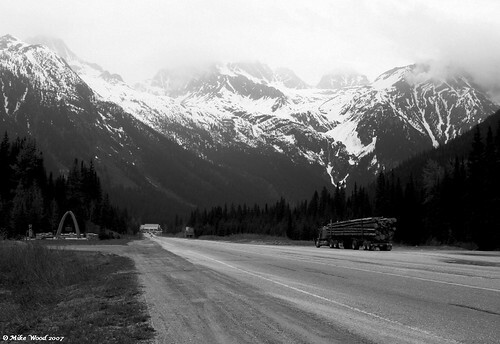 Today as I drive up to Rogers pass it was overcast and about 13C and dropping lower in the higher elevations. I can only imagine what it would be like in winter!. 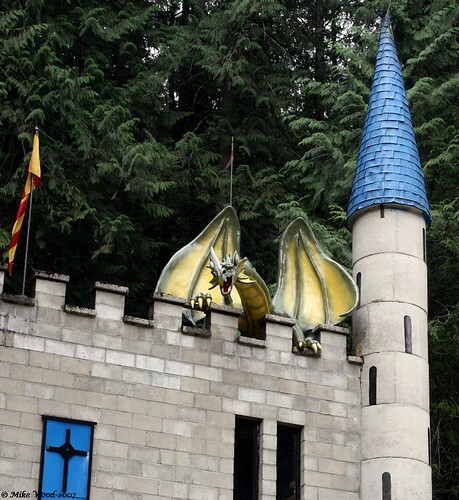 There were a couple of things I wanted to check out on the way to Roger's Pass - other than the mountains. And with those spikes into the sky wrapped in cloud it would have to be ground based. I thought I would start with the last spike. The Last Spike on the CPR railway connecting east n west. 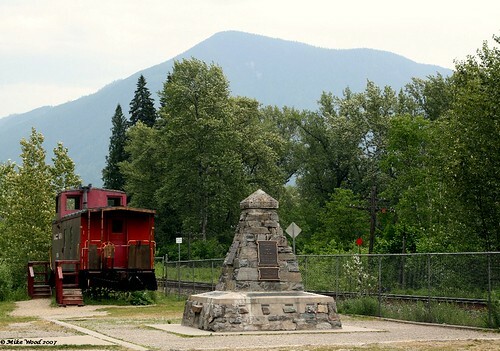 It is in Craigelllachie near Revelstoke on Hwy 1. And was driven in at 922am on November 7 1885. 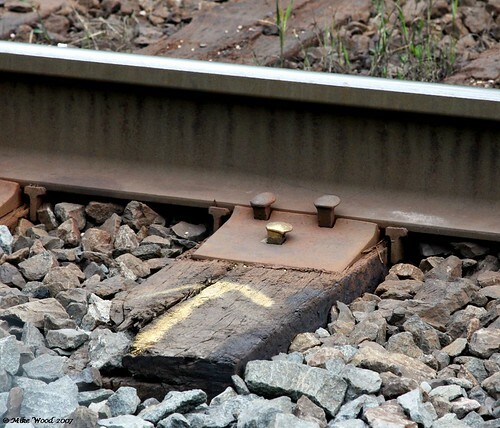 The first picture shows a gold coloured spike in a railway tie. I doubted that this is the actual spike as someone would have taken it sometime in the last hundred or so years, but that is the location of it. I checked wikipedia and sure enough it is a conventional spike, the ceremonial one being removed to ward off souvenir hunters. The actual spike was given as a gift to the son of the patent office president at the time, and is still in the family's possession, fashioned into the shape of a carving knife. :) You really have to wander around the mountains to appreciate how difficult it must have been to construct the railway through these massive hills, mountains and passes. The scale of it all is staggering. Something we more or less take for granted these days. 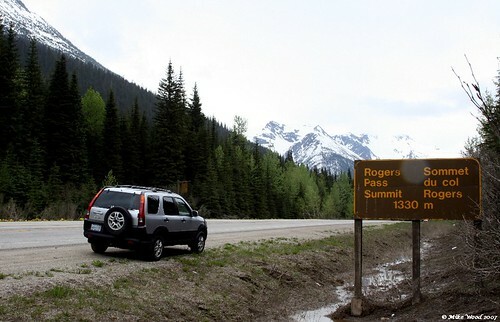 So, after gassing up, I drove on towards Rogers Pass. 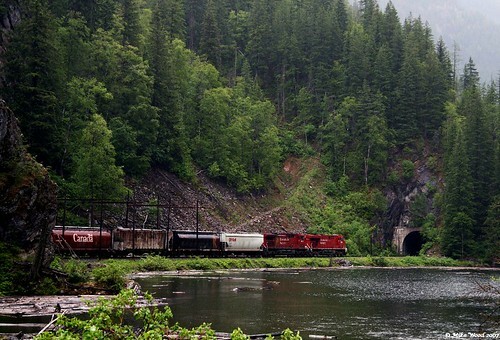 It is at 1330m and is the route the railway and the TCH takes between Revelstoke and Golden. 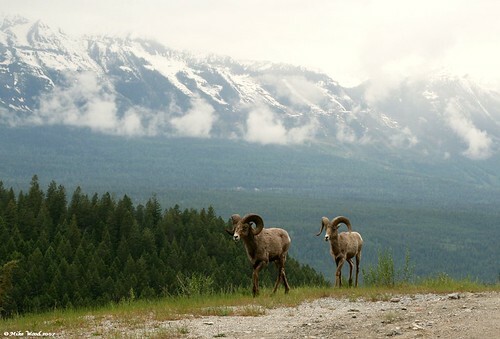 It is in the middle of the Glacier National Park and has been accessible since about 1886. And by accessible.... it gets up to ten meters of snow a year. To keep the highway open in this part of the country prone to avalanches, 105mm howitzer field artillery guns are used to cause controlled avalanches. You see here n there marker circles on the ground which I have to assume are for the positioning of the guns. Rogers pass is cool. It is way up there. compared to the sunny and calm Crowsnest pass, this one, when I finally pulled in around dusk was a contrast. 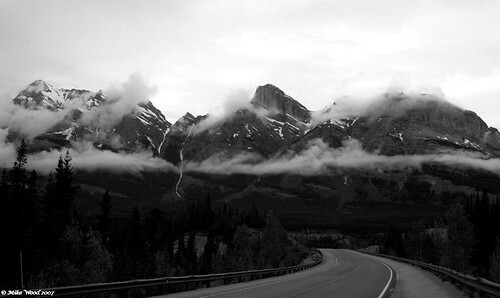 Tall sharp angular Selkirk mountains brooding in their cloud wrapped peaks. 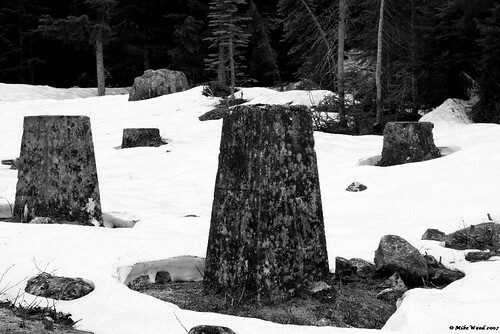 At one point there was a large CPR hotel located near the summit known as Glacier House where passengers from trains could stop over and dine. the nintey room hotel was operated from 1887 to 1925 with Swiss guides hired to show guests the mountain peaks. When the Connaught tunnel removed the need for trains to negotiate the pass, the hotel closed and was soon demolished. 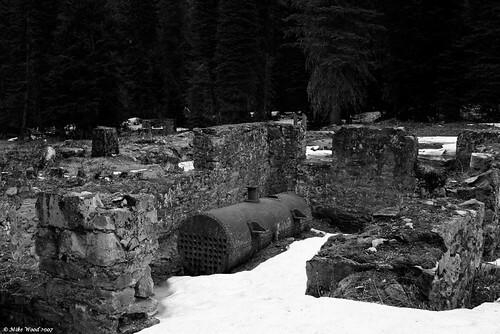 All that remains in a quiet snow filled clearing well off the current TCH (took me about 25mins to walk to it) are the building footings and piers and a couple of boilers. I stayed at the Best Western Glacier Park Lodge right in the pass. A nice place but showing it's years. I would stay there again and would recommend it as a stop over on your journey one way or the other through the rockies. a nice small bar and friendly staff. Wireless too. I chatted with one of the staff who said that the place had gone down hill in the past few years since the new owners had taken over. The original owners of the place knew how to run hotels but the current Japanese ones, who owned a couple of other hotels didn't and they were not willing to put in the amenities and upgrades hotels need from time to time. He also apologized about the lack of hot water when I checked in. I had been preceded by a bus load of Japanese tourists and it is the custom aparently for them to all shower the moment they get to a hotel. So 100 showers at once. what this does is tax the boilers to death. To the point that one blew and caused he thought somewhere in the neighbourhood of 20k to fix and repair. He also said they were not getting the traffic they used to. That had the tour group not been there, I would have only shared the hotel with about 6 other guests who were working on the highway doing repairs. 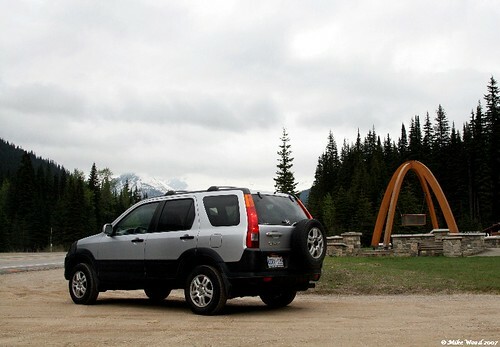 In the morning, still mist covered and rainy, I headed on to Golden BC (timmies there!) 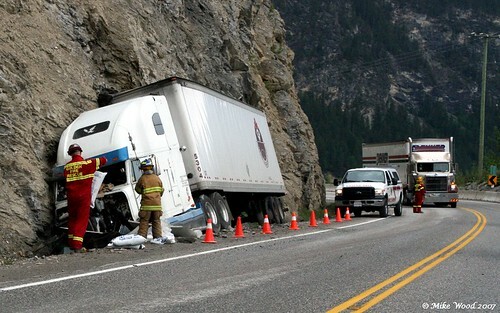 and saw my first Mountain Goats and a truck that had its not best day on a twisty mountain road east of the town.